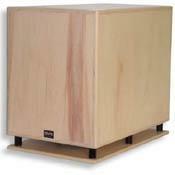 I glad I purchase this SVS Subwoofer, I purchased it from a one owner, no-smoker environment. I've had for two and a half months and this baby really kicks. I look forward to coming home either watching movies or playing the music. smooth from top to bottom, low extention, loud output, biult in eq. large, need to pull away from wall a little because of the rear ports which can make boomy bass. I purchased 1 of the ultra/2 subs last year. best sub Ive heard, period!Need less to say I purchased a second a month ago and I couldnt ask for a more balanced sound from top to bottom. Theres no need to talk about the output level as you couldnt possibly use any more then this. It will litterally make you sick from your ears ringing-in a large room! best sub out there, dont hesitate to buy it! great place to order from.erik and ron are great! velodyne hgs-18, servo 15, descent martin logan, ive owned them all. Extremely powerful and articulate bass at any level. Variety of set up features including Parametric EQ, variable phase, crossover bypass and SVS's famous variable tuning (25hz, 20hz and 16hz tuning points). Limitless dynamics in vitually any room. Extremely well built at 190lbs! Georgous variety of finishes available. Heavy but what do you expect. Waiting for it to arrive after you purchase it. Kind of big but I personally like that. I've been in to home audio since I was thirteen. I have always looked for audio products that can deliver realistic performance without sacrificing sonic quality. To me, a good speaker is one which can deliver high sound pressure levels while retaining it's composure and balance. A good subwoofer should be able to do the same, regardless of volume. I recently purchased a SVS PB12-Ultra/2 for my music and HT setup to replace my trio of relativly inexpensive subwoofers and what I got was more than even I expected ( I was drooling over this sub for 4 years). The day my sub arrived I was in shock, the box it came in was huge and the sub itself was not much smaller. When I unpacked it I was in awe of the beautiful cherry finish. This is one of the best finishes I have ever seen on an speaker or a piece of furniture, with its satin clear coat it looks absolutly stunning! This thing will look good no matter where you place it, although the more you can see it the better. Now to the fun part. After placing it in the corner just behind my left front speaker and setting the level to the 9 o'clock position I was ready for some serious demo time. The first thing I tried was Pink Floyd's Dark Side of The Moon SACD and the heartbeat at the opening was incredible. I could feel the entire room pressurize and could hear the studs in the wall creaking and the door to my listing room vibrate in it's frame. Kick a**!! My listening room is not large at just under 2000 cubic feet, so this sub is more than anyone could need or ever take advantage of in a room this size. The musicality of this thing is amazing too given its brute force. It's much tighter and controlled than the Mirage BPS-150i I had previously and can do it with so much weight and slam it can be damaging if used improperly. After the initial rush wore off I decided to try it out for HT duty, which is what a sub this powerful is best at. For this series of tests I pumped the volume up to about the 11 o'clock position with the crossover bypassed and my reviever's bass managment set to 80hz and proceeded to try out some DVDs. The first one I tried was Master and Commander and the canon blasts in the opening battle where absolutley bone jarring. I could feel the bass pound right through my spine, not to mention extremly loud (114 db according to my SPL meter). The slam this thing is cabable of is frightening, and at this level the sub still has lots of dynamic headroom and sounds completly controlled. The second DVD I tried was Jurrasic Park 3 in Dts 5.1 surround. The scene where the spinosaur and T-Rex fight was probably the most intense bass I have ever experienced in my life. The sheer amount of low frequency energy this thing was capable of during this scene was crazy. It managed 117db peak without straining or bottoming out and still remained controlled and tight. It actually was flexing the screen on my CRT RPTV and managed to shake itself six inches away from where I had placed it and this thing weighs 190 pounds!! This is incredible performance for any subwoofer at any price and this thing only costs $2199.00 U.S. I would recommend this subwoofer to anyone who is looking for uncompromising performance for both music and HT and like me doesn't have $5000 plus dollars to spend. You can't come close to this level of performance and quality for the price of this thing, that's the beauty of buying direct from the manufacturer. I haven't dealt much with SVS's customer service except when ordering but it was second to none in my experince. This thing definitely ranks up there with one of the most powerful and accurate subs out there for any price. Of course, everyone wants to say/believe/validate their sub is the best. I am sure you can buy a better sub when money is no object, but nowhere near this price point. I can honestly say after auditioning the DD-15, the PB-12 Ultra/2 is in an entirely different league. The Ultra/2 has soooooo much headroom and impact that even some of the largest rooms or nearly deaf home theater enthusiasts will not push this thing into any audible distortion. Ya sure, you don't get the fancy servo or auto-EQ, but when considering the output and value it's a slam dunk. This subwoofer simply sounds great, period. I would seriously question the validity of any claims to the contrary. They either have never heard the Ultra or have configuration issues of some kind. I highly recommend auditioning one in your environment. I don't know how anyone would be dissapointed. Yes, it is a large enclosure, what sub that has this kind of output isn't??!?! Good solid construction. Eq feature. Deep and Loud. SVS customer service was honest and fast. Balance. It's important in life and important in speakes. Who wants a sub that sounds great but can't play loud? Who wants a sub that plays loud, but doesn't sound good? If you've got the money (and a wife that will let you bring this monster into your house) the SVS PB12-Ultra/2 is for you. At 190lbs it is more of a piece of furniture than a sub. It is huge. Make no mistake, you cannot hide this baby. I had to use two locations before I felt it was dialed in. Once the sub was set up and the eq was done, WOW, deep, loud, tight. You will hear and feel bass that you didn't even know existed. No boom, just bam! I know that most people won't spend this kind of change on a sub, but for those who do, you are buying a component that you will never need to upgrade or replace. It is rare that you can buy anything audio and be able to say that. Very very few will go deeper or louder. And nobody does for anywhere near the price. More SPL Quiet when it should be, loud when it needs to. Price. Much less than comparable competitors. After working with Tom V and Eric to determine which Sub was right for me and my room, I decided on the PB12 Ultra/2. After receiving the sub and hooking it up to my system, I was shocked with how much bass I had been missing. Previously I had been using a single 12" sub by Klipsch. Movies now have better impact and draw me into the action. Music is better as this sub blends well with my Ellis 1801 stereo speakers. Before the SVS, the sub would seem to add too much to music and not nearly enough to movies. If you want to upgrade to high end sub, I would highly recommend this one. I tested Paradigm, Velodyne, Klipsch, Martin Logan and other subs before buying, and could not be more pleased with SVS.